Conventional air conditioning is not a sustainable solution to the challenge of a hot or humid climate. The climate problem is compounded in so-called Urban Heat Islands, urban areas where the air can be 3–5°C hotter than its surrounding areas and where pollution levels are consequently raised. 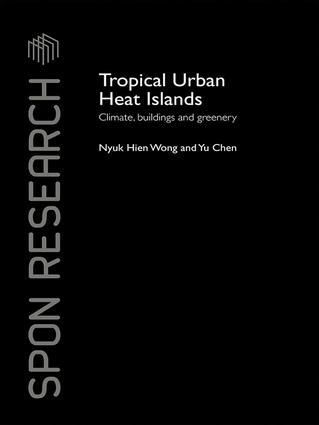 Including a colour section with thermal images and maps, this book explores the complex relationships between climate, buildings and plants, especially in urban heat islands. These relationships bear very critically on a range of environmental issues and point to some corresponding solutions. One chapter highlights some of the extensive research work carried out in Singapore, especially investigating the thermal benefits of greenery in buildings in the urban setting. Though several books have been written on urban heat islands, this work uniquely examines the linkages between climate, buildings and plants. It forms a reference for researchers and professionals such as architects, architectural science, landscape architects, building services engineers, urban planners and urban climatologists. It may also be useful for final year undergraduates or graduate students in these disciplines. "This is a very thorough book, which … has applications for highly urbanised areas in almost any climate and should therefore prove to be of value to architects, developers, designers and policy makers involved in urban planning." Nyuk Hien Wong is Associate Professor and Programme Director of the Master of Science (Building Science) programme in the Department of Building at the National University of Singapore. Yu Chen is a graduate student in the Department of Building at the National University of Singapore.